Chad’s fast-paced lecture combines a high-energy performance along with humorous explanations to bring an enjoyable experience to all. It’s filled with both close-up and stand-up effects using everyday objects such as cards, coins, dart guns, pens, rubber bands, keys, spray paint, finger rings, lint brushes, matches, spaghetti and more! This material has been honed by years of performance and there is truly something for everyone! 5. Thank you to our November 2016 Friends! - Thank you! 4. Thank you to our November 2016 sponsors! - Thank you, too! 3. Toronto: Jason Palter and Ken Margoe - A fun night, I'm sure! 2. Shriners' Holiday Magic Shows - Interesting that the post about the 2015 tour is attracting so much traffic. I've added a link to the 2016 tour to this post. 1. 2016 Shriners' "Holiday Magic Show" and Firefighters' Fundraising - Happy to see there's so much interest in these fundraising shows! Congratulations to Derek Selinger, Jason Palter, and everyone else involved with short film "The Walking Man." It recently won an Award of Excellence at the Canada Shorts Film Festival! At one point we asked him to be judge for the contests. He laughed and asked if he had to wear his robe. Of course he accepted and he turned out to be one the best judges we ever had. His approach to judging was so different from what we were used to, but it all made sense. His commentaries about the contests were a joy to read and most of all very informative clear and concise. We learned a lot from him. Thanks for sharing your memories, Phil. Au CHUL, le 2 juillet 2016, à l’âge de 90 ans, est décédé l’Honorable juge Anatole Corriveau, époux de feu madame Marie-Berthe Rousseau. Il demeurait à Québec. With thanks to Dennis Schick from the IBM for sending this information along. Happy sixth blogiversary to me! Six years ago today, this blog was born! Thanks to you wonderful people who have supported this project! More than 2,790 posts have been published, and well over 98,500 page loads have been served (over 479221 by Blogger's count). One hundred and seventy-four of you have given us your thumbs-up on Facebook, more than 1070 of you are following along on Twitter (17,000 tweets and counting! ), and approximately 60 of you have subscribed to this site's feed. The bulk of you are Canadian, and I'm delighted to see visitors from United States, the United Kingdom, India, France, and the list goes on. All of you readers, Likers, RTers, submitters, guest posters, contest prize providers and all other manner of promoters of this site. All of my sponsors, past and present. That means you: Magic Information Canada, Ryan Pilling, Clive Court, Perfect Magic, The Browser's Den of Magic, and The Amazing Corbin! All of the blog's official friends, past and present. That's you: John Smithman, John Harrison, Richard Lyn, Joan Caesar, and Ted & Marion Outerbridge. ... come in and see us while our 40th Anniversary Sale is on. Read more and shop now! 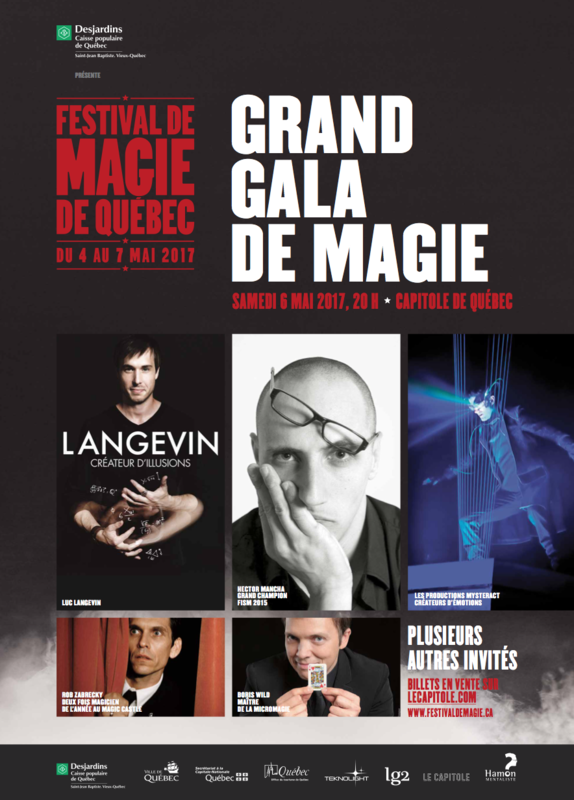 Great names coming at the Festival de Magie de Québec MAY 4 - 5 - 6 - 7 2017 . And more to come !!!! Dear friends, this month is crazy! Here are all of my public performances and where you can catch me. I am still taking some bookings for holiday parties, if you know of any please send me a message. For the last lab magic of the year 2016 on Wednesday, 30 November, we're looking for testers. If this interests you let us know. The graphic on James' site states that the show is running every Tuesday in November. Contact Ben Train for more information. See if you can say that 5 times fast! Congratulations Keith, on getting one of the early bird spots for the London Fringe! And if you wonder what he is all about, you can watch him on this clip from Keith's September appearance on Rogers TV. It's been a while since I was at the RAWF. If I recall correctly, it was for one of Kidlet's school field trips. We would have had so much fun if The Agri-Magic show had been playing when we went! Visit Ag-Tivity Central and join Canadian magician Daniel Steep as he introduces families to the magical world of Canadian farming and agriculture. This high-energy, educational and interactive show is dedicated to creating a positive image of the Canadian Farmer and Ag Awareness. I missed the auction, but heard it was absolutely packed, with a lot of great deals to be had. There are lots of a amazing finds and deals in the Back Room. The trivia segment was great fun, as always. Jeff has a lot of very knowledgeable patrons! Among other things, trivia question answers included: Jeff Hinchliffe, Abdurrahman Ahmed, and 1995. Congratulations on another great anniversary event, Jeff et al! Please join me in welcoming our newest Friends, The Outerbridges! I first met Ted and Marion Outerbridge at Sorcerers Safari a couple of summers back. You may have seen them at the IBM convention in Jacksonville in 2015, or this past year in the Grand Gala performance at the CAMaraderie Convention/Festival de magie de Québec, or at at SAM New York's "2016 Salute to Magic." Thank you Marion and Ted, for becoming official Friends of Canada's Magic! LOS ANGELES: Electus International has secured deals for the new special David Blaine: Beyond Magic, featuring cameos with Margot Robbie and other celebrities, in the U.K., Australia and Canada. Electus International sold the finished tapes to Channel 4 in the U.K., Australia’s Network Nine and CTV in Canada. David Blaine: Beyond Magic is slated to air on ABC in the U.S. on November 15. Toronto: Eric Woolfe in "The Harrowing of Brimstone McReedy"
There is a cool one-man show show running in Toronto until November 13th that features numerous magic routines as part of its narrative of the Klondike gold rush. Performed by Eric Woolfe who performed at the Browsers Bash two years ago. f.y.i. Eric Woolfe and Samara Nicholds formed Eldritch Theatre in 1999 and has since been nominated 15 times for Dora Awards for their outstanding horror productions. Eldritch shows are "Toronto’s Spookiest Stage Shows” (Torontoist) and in “Toronto’s Top 5 Shows To See” (Culture Trip). This fall make Eldritch Theatre a tradition as it’s a “great way to continue the Halloween spirit,” (NOW Magazine). The Harrowing of Brimstone McReedy is a new play by Eric Woolfe (House at Poe Corner, Doc Wuthergloom’s Haunted Medicine Show)) who uses puppets and close-up magic based on the Faust Legend. Our hero, Brimstone, is caught up in the Canadian Klondike Gold Rush of 1897. An alchemy of historical fact, ancient legend, true stories of Old West grifters and card sharps, the works of HP Lovecraft, Algernon Blackwood and Robert Service, and a good deal of heartbreak and whimsy, this epic tale tells the story of a two-bit conman and how he lost his true love to the dark spirits of the North as a result of his greed and lust for gold and “the sure thing” game. Official like butter...#itv new show #NextGreatMagician starts Sunday's November 6 at 7pm. Derren Brown’s Vaudeville Productions and Crook Productions have been commissioned by ITV to co-produce a brand new magic competition show, The Next Great Magician (6 x 60’). Crook Productions is part of Andrew O’Connor and ITV Studios’ Cat’s On The Roof Media, and The Next Great Magician is Crook Productions’ first big entertainment commission since the group’s inception earlier this year. The series will feature the world’s best magicians performing their greatest tricks, many of them for the first time ever on television, as they compete to be crowned The Next Great Magician. Now, at 30-years-old, Lion has propelled himself onto the world stage with his brand of magic that he calls Lionism, a blend of arts of astonishment, which includes illusion, mentalism and hypnosis. “When I was getting into magic, I didn’t want to just be labelled as a magician, because I was also interested in mentalism, which is mind reading and prediction, but I was also interested in hypnosis,” Lion said. Thank you to our November 2016 Friends! Thank you to our November 2016 sponsors!